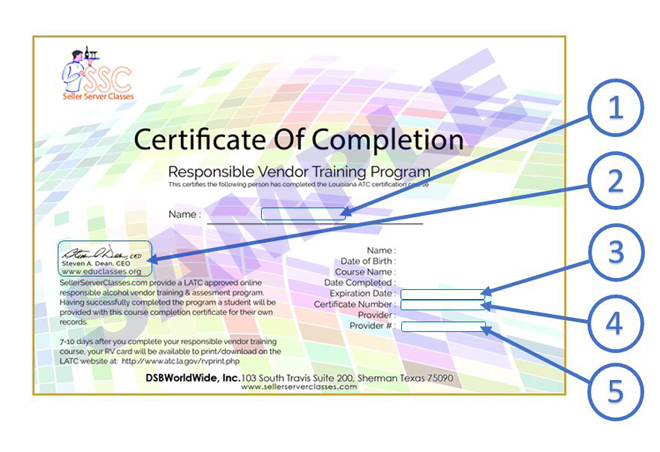 The SellerServerClasses Responsible Vendor Training program has been approved by the Louisiana department of Alcoholic and Tobacco Control (ATC). Responsible Vendor alcoholic beverage seller server (Bartender, Drinks Service) certification from Louisiana.SellerServerClasses.com is the best way to get safe seller/server training online. How do I get a bartender permit, license or card in Louisiana? (2) Study the course educational material (2-3 hours). (3) Take the course assessment test (30 min - 1 hour). (4) Print your temporary Louisiana Seller Server Card. (5) You can print your ATC Responsible Vendor card 4-7 days after completing your course at http://www.atc.la.gov/rvprint.php.